Review of Meydad Tasa – Ata Melech – Brand new writer! Wow! Meydad Tasa never ceases to amaze me. He sings with such pnimiyus and inspiration. His latest album is called Yehudi Benishmati. 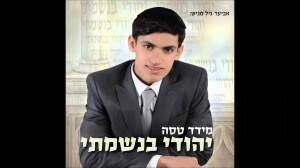 His albums are Sefardi style with Hebrew lyrics and not pesukim from Tanach. I am not fluent in speaking Hebrew, but he sings from the neshama and even if I do’t understand all the words, I can still make out the basic idea of what he is trying to say. The third song he has a guest solo – Aviad Gil who is the producer of his albums. All the lyrics of his songs describe his yearning to connect to Hashem . His common phrase is “ani ben shel melech” and this is reiterated in all his albums – this one no exception. The 5th song is called “Neshama” . This is a slow song so it is easier for me to catch the words and understand them. It really describes his yearning to cleave to Hashem. While there are tons of Jewish songs that talk about Hashem, I feel that his have a demand for accountability. Instead of the theme being to beg Hashem to have pity on us and send Moshiach – the theme here is to grow in our own Avodas Hashem. The next song – #6 on the album is called Avi Malki. This is more of a chizuk song for a person not to give up. #7 – Osim Tshuva starts with a recording from a drasha from someone about the love the Yidden have to Hashem and the song is about doing tshuva. Apparently, it refers to secular Jews becoming frum, but it doesn’t ignore the fact that religious Jews also have to come back to Our Father. It is enlightening to hear someone discuss tshuva as seeing the light with love and not that Hashem is scary and is looking to bop you over the head at the slightest aveiro. #9 – Na Elokim is a geshmake upbeat song as well as #11 – Rav Elbaz Lo Mevater that describes his Rebbi – Rav Elbaz that is osek in bringing back Yidden to Yiddishkeit. In middle a chorus sings “Yomim al yemay melech Tosif” – quite shticky. If you want to get some inner spiritual juice stirring inside – listening to this album is one way to get it. You’ll enjoy the music also – up to date but not goyish. Na elokim is one of the best songs I have heard in a while. I wish the other singers would sing creative lyrics like Meydad Tasa, instead of just picking some random posuk that has no relevance to the singer or the listener.